Pre-heat oven to 176.6°C / 350°F. Set muffin tin on top of a large baking tray (to catch runoff) and grease 8 of the cups. Wash the plums, and slice into narrow pieces. Melt butter in the microwave and stir in brown sugar. Spoon into muffin cups, and layer plum slices on top of butter. In mixer, beat white sugar and shortening in on medium until fluffy. Combine in a bowl: flour, baking powder, and salt. Stir into shortening mixture. Add milk and beat on medium until smooth. Spoon into muffin cups, and shake to settle. Bake for 20 min, until a toothpick inserted comes out cleanly. Let cool in pan on wire rack for 10 min, then run knife around edges to loosen the cakes. Invert onto the cooling rack. 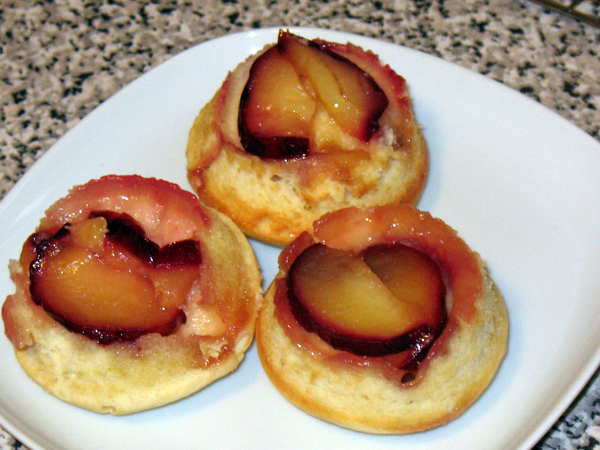 Pieces of plum may be stuck inside the muffin tin, use tongs to remove and drop onto cakes. Cool another 5 min before eating.